Move with the Arrow Keys. Jump using Shift. Hold Jump to vary your jump height. Grumper is a Jumper clone I decided to make after playing the newly fixed Linux version of Super Meat Boy for a while and then reminiscing about the classic Jumper games by YoMamasMama, and then wanting to design a Jumper-esque game of my own. I also made it because a while back, Sergio suggested I try experimenting with game difficulty by deliberately making the game easier or harder to play. The game itself is quite like Jumper, although it uses Super Meat Boy-style deceleration (insta-brake while on land). Unlike Jumper or Super Meat Boy, however, you can't double-jump or wall-jump. - You want to get to the rapidly spinning portal on the other end of the level. 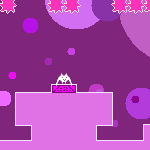 - Leaving the screen from ANY side will kill you, as will colliding with a spike ball. When you die, you reconstitute at the beginning of the level and any moving gimmicks will reset. - The up-arrow blocks bounce you high (sixteen blocks high I believe). Normally you can only jump four blocks high. When you hit these blocks from the sides or from below, they act like a normal wall (that is, they don't bounce you). - Red, green, blue blocks are toggle walls, which can be turned on or off by tapping the same color power switch. - Moving platforms travel horizontally in one direction until they hit an obstruction, causing them to reverse. The game is broken up into three difficulties: Easy, Normal, and Hard. - Normal is the original set of 15 levels I created. The set starts off pretty basic with the first few levels, but gets pretty challenging near the end. Perhaps the difficulty curve is rather steep, but with only a small set of levels there isn't much I can do about that. Intended for most players (hopefully). - Easy takes the Normal levels and makes most of the jumps shorter/easier, adds guard rails in some places (to prevent you from flying off the screen too easily), increases the coverage area of spring blocks, etc. 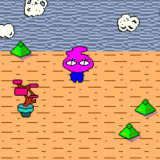 - Hard takes the Normal levels and increases the coverage area of spikes, shrinks a lot of platforms, and sometimes even forces you to complete a level in a roundabout way. Expect some rather tricky jumps. For veteran players only. As you complete each level, the game saves statistics into a file on your hard drive. After you finish playing, look for a file in the game's folder titled "stats-16986802.txt" or something similar (the game will tell you exactly what the file is called). You can then select View Results from the main menu, choose this file from the selection dialog, and be able to view all the places you died, and how many times you died on each level. It would be pretty cool if you could upload the statistics file here as a comment attachment. That way I could see where people are dying the most, and just how difficult my levels are. Granted, the statistics are rather basic. They only include death locations, which aren't incredibly meaningful as far as determining where players are having trouble, especially in the more open areas. I tried addressing this a bit by adding in some spikes where you would normally just fall to a lower level on a failed jump. Still, I'm curious about this (and I don't feel like improving on the system - I'm kinda fed up with MMF2 right now as it is). Note: Even if you don't finish the game (you give up on a certain level and close the game), it will still spit out a statistics file, and you're welcome to submit that as well. It just won't include statistics for any unfinished levels. This really is Game Maker territory. Game Maker excels at tile-based multi-level games where the same elements are reused throughout each stage. MMF2 does not. In fact, MMF2 has really poor support for global objects. This forced me to stuff all 15 levels into a single frame rather than have them on separate frames in order for me to retain my sanity (otherwise I'd have to retroactively apply changes to EVERY SINGLE LEVEL ONE BY ONE every time I wanted to change something). And then I tried squeezing 45 levels into the same frame but MMF2 really choked on that. I was forced to use a separate frame for each difficulty, thus any changes I might make in the future (if I can even be bothered) are not going to be global across difficulties unless I manually apply the changes to all difficulties. Also MMF2 is slow. Really slow. I think if I were to make a similar game again, I would stay far away from MMF2 and use something like Game Maker 5.3 or hell, even C++/Python/some other established programming language with Allegro/SFML instead. Klik just isn't cut out for this. The music comes from an old module song, "galactic" by dark halo.